Chicken Coop Wheels – Let's Roll! - FREE CHICKEN COOP PLANS! Whether you own a large, medium, or small chicken coop, having wheels on it can make a big difference of how “user friendly” your coop can be. I own a stationary coop but have been contemplating adding wheels for quite some time. But are chicken coop wheels really needed? 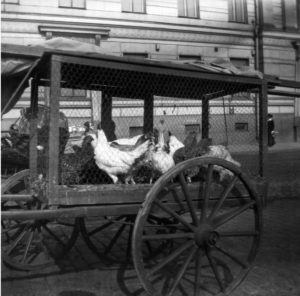 In this article we’ll take a look at whether having wheels on your coop is helpful or not. We’ll also discuss the types of chicken coops that come pre-made with wheels, what type and size of wheels work best for chicken coops, and where they can be purchased. For more information on building your coop, see our free guide in this article. As with anything in life, there are pros and cons. The same goes for mobile chicken coops but, by and large, there are a lot more pros! Move It All Over Your Yard – Moving your coop can be great for both you AND your chickens. By moving it around to different areas of your backyard or pasture, your chickens get access to different bugs and fresh grass each time. Not only that, but your grass will benefit from the droppings, which help to fertilize the grass and soil. So it’s a real win win! Your flock will be happier being outside all day, checking out new areas. Allows you to place your coop where ever you want…and if you suddenly decide you don’t like the placement, just move it again! It’s like rearranging your furniture, but with your coop instead. It can be harder to make the coop predator proof. 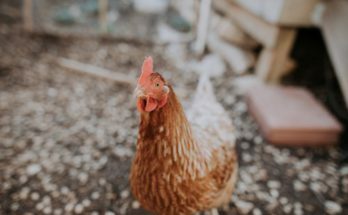 Most mobile chicken coops with runs have a galvanized wire mesh that encloses the run, but there often isn’t anything around the perimeter of the run so larger animals like fox or coyotes can dig and scratch their way under the run. Or if the wire mesh is not secured tightly, they can simply push in the sides to get in that way. With stationary coops, it easier to make the coop predator proof because you can add rocks around the perimeter of the run or dig a 1 foot trench around the outside of it and add chicken wire in it before filling it back in. This will keep the predator from digging in from the outside. May have to move/re-position the feed and/or water containers each time you move your coop. There are many coops that you can buy which already have wheels attached. They are called Chicken Tractors or Mobile Chicken Coops. The advantage of these coops is that if you’re looking to build or buy a coop you can move all over your yard, you can buy it pre-made this way which will save the hassle of adding wheels to a stationary coop. Many people like the perks a mobile coop offers (as mentioned above). If you want the ability to move your coop around the yard, this is a GREAT way to go. Your chickens will also love the change of scenery! But if you have predators in your area, it’d be smart to make your coop predator proof by either adding rocks around the perimeter or, at a minimum, nailing or screwing in the run’s wire enclosure. Some coops you buy online are not always made of the highest quality, and many coop owners have complained that the wire mesh enclosure is simply stapled in, not nailed, so it may have a tendency to cave in if an animal leans on it i.e. a fox, coyote, and the like. More on chicken coop reviews can be found here. 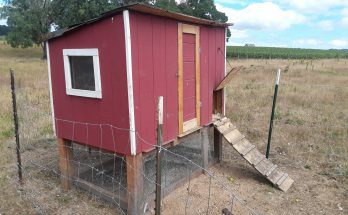 Chicken Tractors With A Run – These mobile coops have a “coop” area to house your chickens, but also have an enclosed outdoor area called a Run where the chickens can chase bugs and look for seeds, grass etc. This is by far the preferred option as it allows the flock to run outside exploring, but not eaten by predators. Chicken Tractors Without A Run – These are essentially chicken coops on wheels, but do not include much of an area for the flock to be outside. However, some of these coops are made with a small run, which is better than no run at all. Generally speaking, though, your chickens will be happier and healthier if allowed to be outside so the bigger the run, the better. Having said that, if you are able to free range your chickens a coop with out a run will work just fine! You can still move the around the yard or pasture so the chickens don’t wear down the grass where the coop rests, but it’s completely optional. The above tag line may be a bit of a general guideline, but mostly holds true. Physics will also prevail here…the larger the wheel, the easier it will be to move your coop! Although this may be true, large wheels may not be what you want in your coop design and that’s fine. Smaller wheels can do the trick but let’s take a look at some wheel choices that work best. Examples of large wheels could be Wagon wheels, Bike tires, Motorcycle tires, Wheelbarrow tires. Wheels that can be used for small chicken coops could be lawn mower tires (push mower), swivel wheels, which are also called Castor wheels. When thinking of adding wheels to your coop, there both fixed and swivel wheels can be used to make your coop mobile. Both types have their advantages and disadvantages. Also called castor wheels, these wheels are not designed to swivel while rolling. The wheel will roll just fine, but without the swivel, the owner has less maneuverability for getting in tight spots. And one has to be careful not to damage the frame when trying to lift and turn the coop while moving as there can be a lot of tension where the wheel is connected. That being said, it will work just fine – just practice a bit of added caution while moving it. If you are simply moving your coop a few feet at a time, these work just dandy! They are also the most common type of wheel design used for chicken coops. They can be bought at hardware stores, box stores, or on Amazon. Swivel wheels allow the wheel to twist or turn while moving your coop. This makes for easier turning and more maneuverability than fixed wheels. Sometimes they cost more as well but having added maneuverability may make the extra money worth it. Swivel wheels can be found at Home Depot, hardware stores, or on Amazon. To explain the difference between fixed and swivel wheels, think of shopping cart. At the front of the cart are the swivel wheels that twist and turn while moving, making it easier to turn. The back wheels of the cart are fixed wheels – they roll just fine but don’t twist/turn like swivel wheels so are more limited and awkward for making turns. 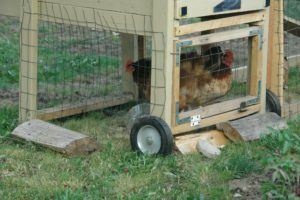 If you picture having 2 (or 4) wheels on your chicken coop, you may want to use swivel wheels when possible, especially if you plan to move it to tight corners in the yard. If you have a large yard or pasture area to make wider turns, fixed wheels will work just fine. If you’re thinking of attaching a set of wheels to your coop on your own, there are a lot of options that will work great! Below is a list of the more common ones people use. Basically, they are just air filled tires – sometimes with a tube, sometimes not. You’ll see tires like these on wheelbarrows, wagons etc. They generally work fine but I’ve had troubles with these tires leaking air when the weather changes or after they’ve sat for a long period time. Then they need to be aired up again. Not a big deal really…but it can be a bit of pain to air up the tire when you just want to move your chicken coop a few yards. Because they are less expensive than solid rubber tires, they are a popular option. And just remember, you won’t be driving your coop anywhere – it’s only being moved a few feet at a time! They can be purchased at used building supply stores, hardware stores, box stores, or at Amazon. These are the same size as pneumatic tires but are solid all the way through, meaning you won’t have to air them up! On my wheelbarrow, I switched out my pneumatic tires for solid rubber tires because I was always having to fill them with air. Life got a lot easier when I switched to solid tires! I paid more for these tires but it was totally worth it for me since I use my wheelbarrow a lot. 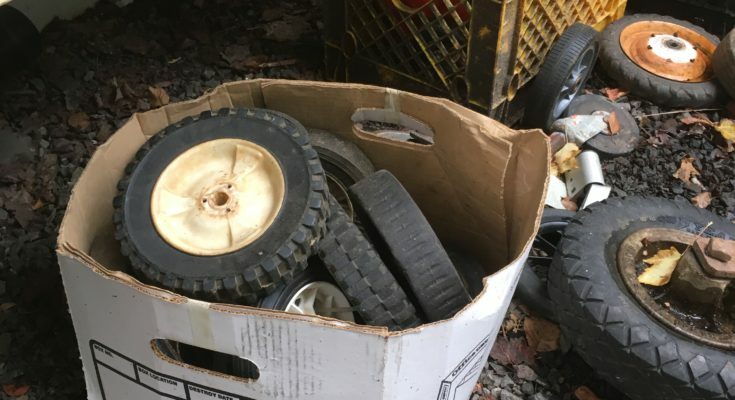 So if you plan to move your coop around a lot, like daily or weekly, you may want to consider these tires as they will be less work in the end. Like pneumatic tires, they can be purchased at box stores or on Amazon. I added bike tires because they are cheap and you can find them at a second hand store, Craigslist, or maybe even the dump! With Bike tires, you may run into the same problem of needing to air them up at times…but the reasonable price may make it something to consider. These are another popular option used by people who are adding wheels to their existing stationary coop. If using the wheels from a push mower, they are often solid wheels – a major bonus! However, they may be a bit small so just make sure your coop isn’t too heavy or they may not work too well. If you’re planning to use them for a small coop with a light frame, they should work just fine. They can be bought at a decent price on Amazon..
I’ve seen wagon wheels on mobile chicken coops as well. They look awesome and work great…but they are rather pricey. I’d highly recommend them if you can afford it. It makes the coop have an old fashioned, rustic look and because they are positioned so high, they roll the coop around with ease. Finding where to buy them can be a bit tough. I did find them online, however. Just be aware that many of the wagon wheels sold online are for decorative purposes only so just make sure it’s designed for use. Some of the wheels I researched can support anywhere from 200 lbs to 500 lbs. If you’re hoping to save money by buying used but perfectly functional wheels for your coop (that don’t cost a fortune), I can so relate to that! 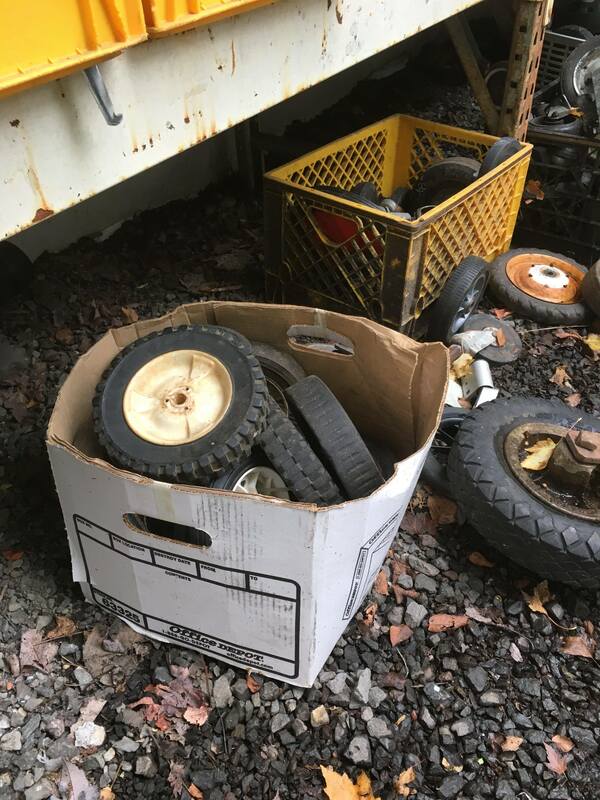 I’ve included a few places where used wheels can be found…the selection may or may not be great and you may have to check a lot of places, but that’s a big part of the fun right?? Second Hand Stores – Goodwill, Value Village etc. A simple google search for your area will pull up a bunch! Repurposed Lumber/Building Supply Stores – Although a lot of these will only carry lumber, many will also have a few other building materials including lawnmower tires, wheelbarrow tires and the like. To make the work of installing wheels to your coop easier, chicken coop wheel kits may be just what you’re looking for! Yes, the cost will be higher so you’ll need to decide if that is worth it to you. Many chicken growers found a way to install them to the coop themselves, thereby saving money and having the satisfaction of doing something yourself – I love that feeling! The wheel kits can sometimes be purchased at farm stores, but I haven’t seen too many in my area. You can check with your area as the situation may be different. There are many kits that can be purchased online, and these by and large get favorable reviews. Many companies selling them include instructional videos on how to install them as well. One popular wheel kit can be found at Amazon. Another is pictured below, also at Amazon. For the DIYer wanting to attach wheels to their coop, I applaud you! It can be so hard to create something yourself from scratch. There are a wealth of YouTube videos on the subject which can further your inspiration. One such “how to” video is below. Check it out! There is not perfect answer to this question. It really depends on your own personal preference. Some people like to move the coop often so as to minimize the amount of damage to the grass. Others prefer to leave it in one spot a lot longer. Personally – I’d want to move it often, like at least 1 -2 times/week so the chickens get access to as many fresh bugs and grass as possible. That may require a bit more work at times, but you’ll definitely have a happy flock of chickens! A great discussion for the topic can be found at the Backyard Chickens forum. I hope you’ve found a few nuggets of useful information about adding (or not adding) wheels to your chicken coop. A mobile coop is a really cool concept and one that can be done by the DIYer. There are a plethora of resources on the internet about the subject so really ANYONE can do it! Whether you’ve already added wheels to your coop or are simply toying with the idea, please leave a comment below about what has worked, what hasn’t etc. We can all learn from one another! Thanks for stopping by. I never thought about dealing with predators for some reason. That seems like a huge hassle. And kind of horrifying to think about, since these are animals you’re taking care of. Me having had a chicken (as a pet not for food) I felt like it was somewhat a part of the family. What kind of predators prey on adult chickens? Hello Ty – It’s amazing just how many predators love chickens! A few that come to mind are Fox, Coyotes, Skunks, Cougars, Bears, Mink, Weasel, Raccoons are land predators. And some aerial predators are hawks, eagles, and owls. An enclosed coop or run will eliminate most of them, thankfully. Thanks for stopping by! I heard of this idea of moving chicken hoops. to put them on wheels I think is fantastic. I had the idea to build a not too big chicken hoop and move it around the garden. It’s good for the garden and the chicken as you say yourself. Why I didn’t execute the project was because I was afraid of having to move the whole weight for my self every time. With wheels though the problem would be solved 🙂 I guess i’d need some bigger wheels due to a quite rough underground. Thanks Stefan! Bike tires would likely work great for a coop that’s not too large, and they will handle rough ground pretty well. And attaching wheels to a coop isn’t too terribly difficult, thankfully. I guess it takes real live experience to come up with something like mobile chicken coop. And what a marvelous idea it is. I never even thought about it, but it makes so much sense. Traditionally our coops were stationary, but built a few feet above ground to deter predators, and to be able to easily santize under the cages to prevent diseases. But if they are mobile they can just be wheeled away. However, I still have a question: If the coop is built with various compartments, so it’s quite large, how can one determine the right type and size of wheels? Hi June – great question. Generally speaking, you’ll want to use larger tires when ever possible as any coop will be easier to move around with bigger tires. 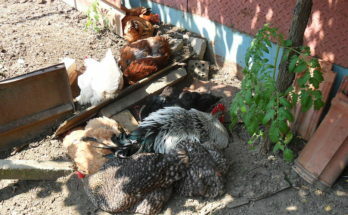 So for larger coops (that house 8 or more chickens) aim for around wheel barrow size or bigger. For smaller coops that are lightweight, smaller tires (like hard plastic lawn mower tires) would work fine. Thanks for stopping by!